Shooting is always fun, but why not combine your range time with a little friendly competition and learn and develop new skills at the same time? Drawing from the holster, moving and shooting, shooting from concealment, speed and drop steel challenge, steel rimfire challenge, IDPA, USPSA, indoor 3 Gun – At Defender Outdoors Shooting Center we are committed to offering shooters opportunities to do more than just shoot at paper targets. Competitive shooting at Defender Outdoors Shooting Center is fun, friendly, unintimidating and is guaranteed to help you improve your shooting! Bring a few friends and have some informal competition on our speed steel course or take it to the next level and participate in our action shooting nights. Competition makes us all better and stronger…. and it’s fun! 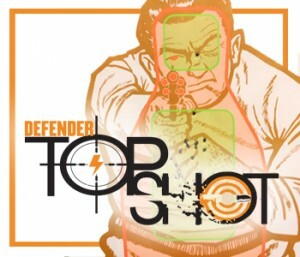 Defender Outdoors Shooting Center is bringing our very own TOP SHOT competition events to you. Here you will find something suitable for every skill level to work towards, compete against and learn from as well as having fun doing it. We will showcase different skills and techniques that are used and taught in many of our training programs to help further your firearms and shooting education. See if you have what it takes to be fast and accurate to compete against your friends, the leader board and other Defenders! Join Defender Outdoors Shooting Center and Cross Timbers Action Shooting for weekly challenging competitions. Want to get involved in IDPA but not sure how? Contact our resident IDPA guru – Sam Moore – at sam@defenderoutdoors.com. Not sure you’re interested? Come on out and watch a match and see what you think – at the very least you’ll meet some great people!!! Also, keep an eye on the competition calendar for upcoming Introduction to Competitive Shooting classes where you’ll learn about the gear you need to get started, the rules, safety and basic techniques. IDPA events happen every Wednesday at 5pm–9pm. Every fourth Wednesday is carbine platform competition. Defender Outdoors Shooting Center and the Defender Training Academy have established our Sim House Run & Gun events. Within these events individuals will be able to move through the Sim House and engage multiple targets, both shoot and don’t shoot, in order to clear out the facility of all hostile targets. 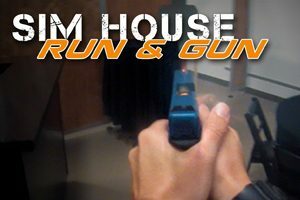 These runs will cost $25 per run in which you will receive firearm rental (you cannot use your own firearm), ammunition, protective equipment and be thrown into a chaotic environment in order see how well you can perform. These runs through the Sim House will be on a first come first serve basis and you will be allowed to simply check in at the front desk and await your turn to run. So bring a group of friends, we can time the runs, and see who the fastest most accurate shooter is in your group.